Now, this is not rocket science. Heck, it’s not even science! I threw this together with stuff I found around the house, and it was a darn good excuse to use power tools. 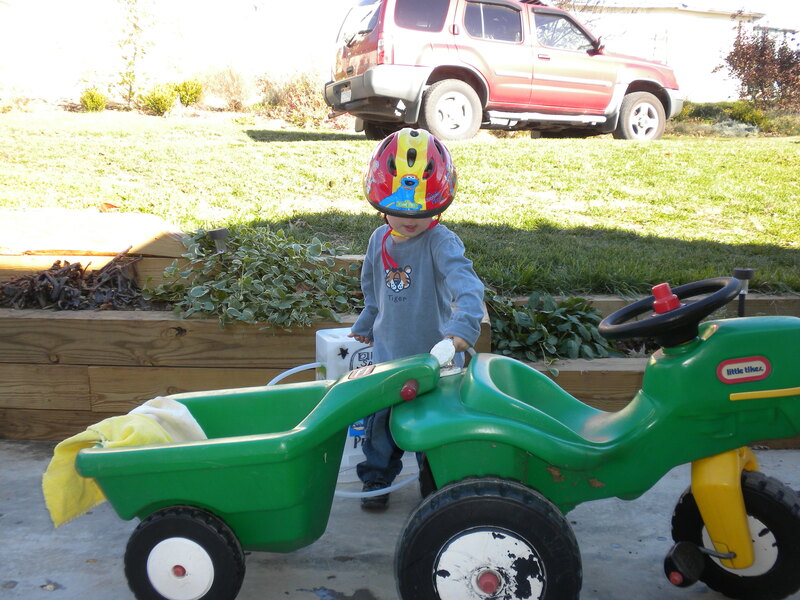 The materials with a helmeted kid. Like I said, it’s a kitty litter bucket, a piece of plastic tubing that I”ll probably get in trouble for taking when my dad goes to fix something, and it’s gone, tin foil, and some duct tape. Throw in a power drill, and some drill bits that were way too big for this project, but I wanted to use, so I did. Notice the perfectly cylindrical hole drilled right near the “with easy pour grips” line. Now, it’s not imperative that you use an “odor eliminating carbons” kitty littler bucket. 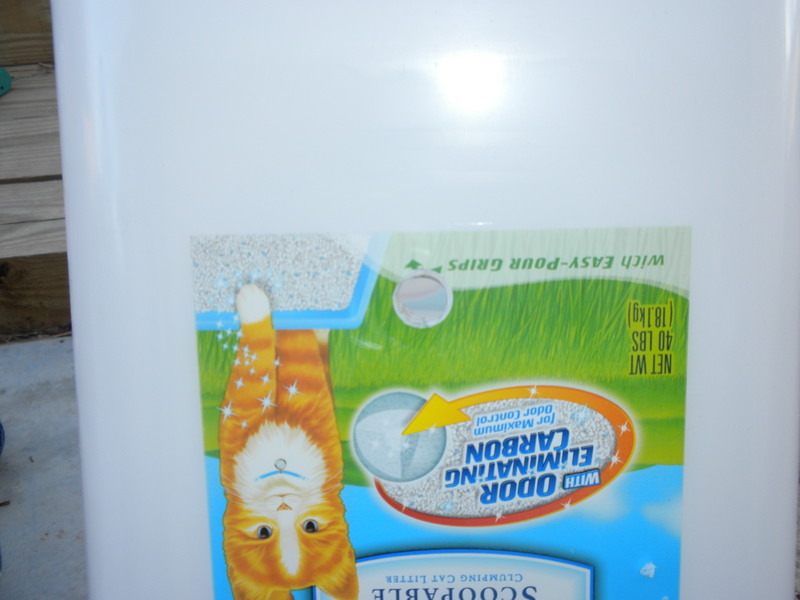 Multiple cats, indoor cat, clumping, or non-clumping littler buckets will work just fine. 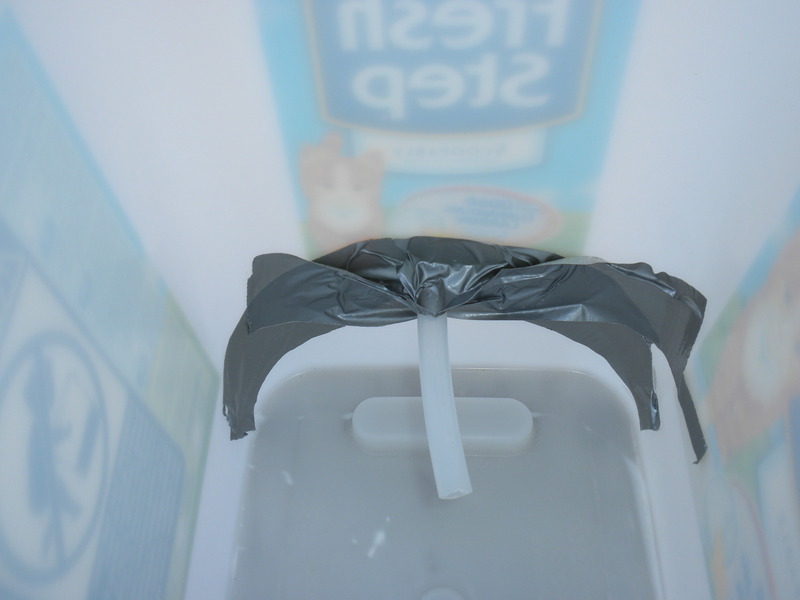 Insert the tube and secure with duct tape on the inside of the bucket. 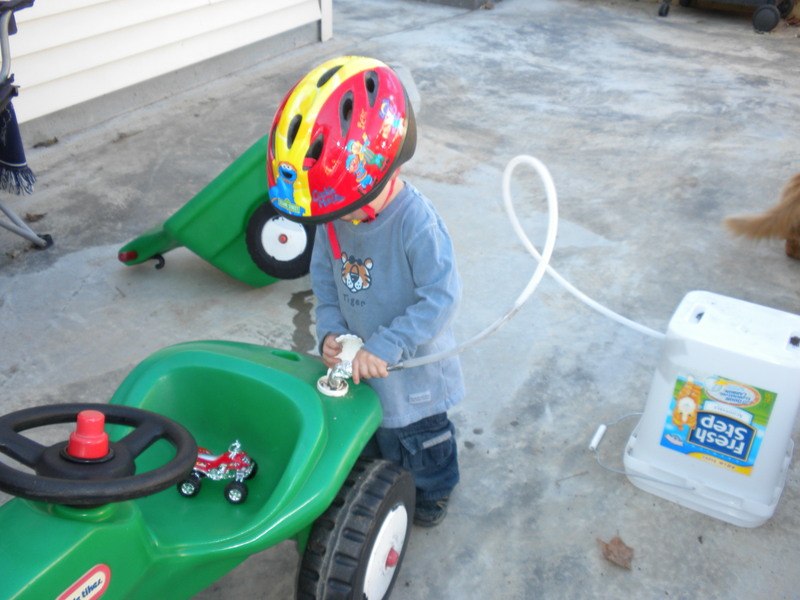 Attach some tin foil to the opposite end of the tubing, and shape into a nozzle. Allow child to play. Child will play for five minutes-tops. Child will then find bug and follow it for a half hour. 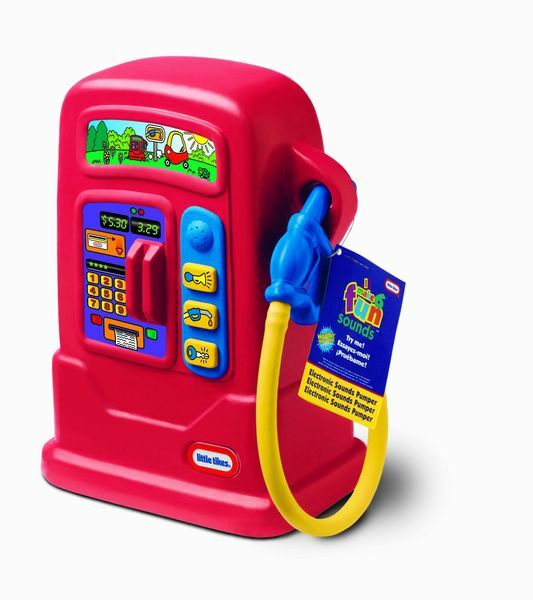 This concludes the “How to build a gas pump at home” tutorial. For more information, please don’t contact me. It’s not exactly difficult. Use your imagination. 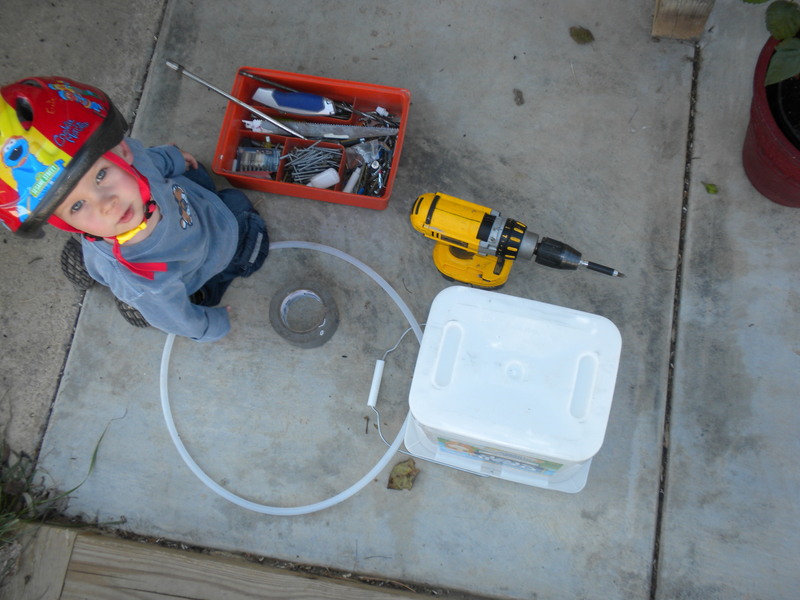 Warning: Feelings of pride at building your child something out of recycled materials instead of buying a toy that will eventually end up in a landfill may arise. Overconfidence in your abilities to build a treehouse may follow. Proceed with caution. As a side note, Rowan has played with this thing every day since I made it. He has incorporated an old Petco card to use as a credit card, and some Guatemalan coins have become his cash for buying gas.